We offer custom designs inhouse for items upto 500g and 500mm2. With over 25 years experience in toolmaking and anti-vibration components manufacture we are able to undertake specialist small to medium components quickly and cost effectively. All toolmaking is carried out inhouse using either mild steel or EN8. Where new tooling is machined, the client has the option for full or part ownership to suit their objectives. We are happy to use existing client tooling where historic suppliers are unable to provide a service. In the instance where a company has ceased trading we are also happy to arrange identification and collection of tools on behalf of clients. 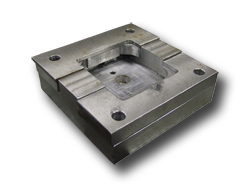 We have a range a platten sizes available and the ability to modify tooling to suit. In the instance where a client has an existing mould but no tooling we can manufacture a tool to suit.